Capacity: 5000mAh. 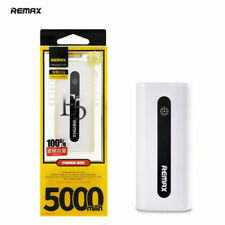 Remax Power Bank E5 Series. Compact & lightweight;. Compatible with iPhone, Samsung, HTC, LG and most USB devices. Easy to keep in bag or pocket;. Very small and light power bank;. It has a unique and stylish design, you can easily carry this device with yourself while on the go or traveling outdoor because of its lightweight & Compact design. It has the ability to prevent your device from over charging, overheating and short circuit and is compliant to FCC, CE & RoHS standards. Capacity: 4200mAh. Form-fitting shell protects your iPhone from scratches and other daily wear and tear, without adding to much weight (97g) to fit comfortably in hands and pockets. UPGRADED WITH LIGHTNING PORT. Color: White/Black: 2200mAh. LED Battery Indicator lights. Rich power,150%-200% of iPhone 5s/5c/5 battery life. iPhone 5/5S/5C in all updated systems. Lightweight, compact and easy to carry. 1x User Manual. The battery power status at a glance with an integrated 4-LED lights status indicator. Indicates charging mode and current battery life. Known before you go! The battery case extends the battery life of you iPhone for hours and provides a comfortable ergonomic design with the complete protection of a hard shell case. The built in lightning connector is compatible with all kinds of iPhone/ iPod. Easy-view LED power status indicators. We pride ourselves on our reputation for ensuring all orders are quickly processed and despatched. We will advise which is applicable.